Need a good mix for your next party or workout session? 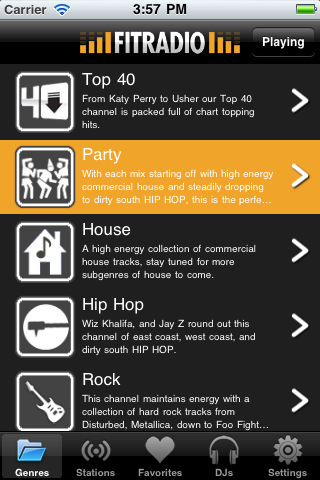 Just grab the free iPhone app from FIT Radio and hit play. You’ll instantly be listening to a professional DJ mixing popular songs in genres like House, Top 40, Hip Hop, Party, Rock, Lounge, and Indie. Audio quality is excellent over WiFI but not CD quality over 3G. You can output the audio over AirPlay to any of your devices. What’s great about the FIT Radio app is that you can not only pick the mixes, but it actually allows you to view a list of the songs used in the mix, and skip forward to any of them. I say forward, because you can’t go back, which is a little strange. While you’re in the Playing screen just tap the forward button to skip to the next song in the mix, or hit the list icon to view all the songs and pick from there. Other things to do here are volume, pause, favorite, and a DJ info screen. Tap the middle of the screen to view info about the currently playing song. If you want a bit more control go into the DJs tab and pick from a selection of DJs sorted by genre to see all the mixes that DJ has uploaded. You can also search for a DJ by name or list all of them in alphabetical order. Now for a few bugs I’ve found in FIT Radio. Although the app hooks into the native iPod controls to playback in the background, for some odd reason the iPod controls sometimes don’t work. When this happens you have to go back into the app to pause the music. Another small bug is about the song info screen in the Playing area. When you pick another song from the mix list, or skip forward, the song title screen doesn’t update to match the selected song. The way to get around that is to tap the screen a couple of times and the app refreshes the song title. Finally the app crashed on me a few times here and there which was a bit annoying. I like that we can add mixes to a favorites list for easy access. It would be really great if they sold the mixes so you could buy them and play them offline as well, since some gyms these days might not have a good enough reception for listening over 3G. As it stands FIT Radio is a no brainer for me, and fills one specific need very well. You want the best mix of fresh new music, and you want it now, without any frills. They lack a little in the Rock and Indie area with only one DJ per genre. As for Top 40 and Party music, there is a ton of content there. If they fix the couple of performance issues, this is easily a perfect music app. AppSafari review of FIT Radio was written by Joe Seifi on June 18th, 2011 and categorized under App Store, Free, Music. Page viewed 6663 times, 1 so far today. Need help on using these apps? Please read the Help Page. This FIT Radio app has transformed my workouts! I even listen to it while i get ready to go out, so easy to use and very user friendly! Great app! I really enjoy this app not only for working out but also for pregame before heading out on the weekend or on the boat at the lake. With all the different genres no matter what moo I am in there is an awesome mix for it.